Deutsche Bank‘s Frankfurt offices were searched Thursday as part of a probe linked to the Panama Papers. The bank is being investigated on money-laundering suspicions raised by a 2016 data leak. The German lender is under increasing pressure after three consecutive years of losses, several executive changes, and massive layoffs. Deutsche Bank shares fell as much as 3.82% in early trading Thursday to around $US9.50 – just above its record low of $US9.21 – after its headquarters were searched in a money-laundering probe linked to the 2016 Panama Papers data leak. Police and the public prosecutor’s office raided Deutsche Bank’s offices in Germany, including the head office at Taunusanlage in Frankfurt, the bank said. Deutsche Bank is suspected of aiding some 900 customers in setting up offshore companies in tax havens, Frankfurt prosecutors said, according to Germany’s media Deutsche Welle. Prosecutors added that some €311 million ($US354 million) is believed to have been laundered. In August, Deutsche Bank uncovered shortcomings in its screening process to fully identify clients and the source of their wealth, according to Reuters. And in 2017, the bank was fined nearly $US700 million for allowing money laundering. 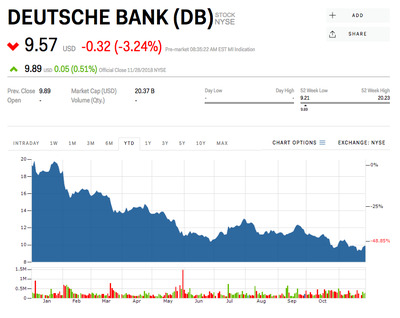 Deutsche Bank has been under pressure after three consecutive years of losses. Its shares have been hit particularly hard this year, down nearly 48% through Wednesday, after several executive changes and massive layoffs. In April, John Cryan was replaced by Christian Sewing as CEO. Then, in May, Sean Bates, the bank’s London-based global head of emerging market debt trading, left the bank. Its head of the Americas,Tom Patrick, will reportedly leave the bank by year-end. As part of Sewing’s restructuring effort, Deutsche Bank said it would cut up to 10,000 jobs – a full 10% of its staff, the Wall Street Journal reported in May.